RINSE the pumpkin and remove the seeds, there’s no need to peel this type of pumpkin. 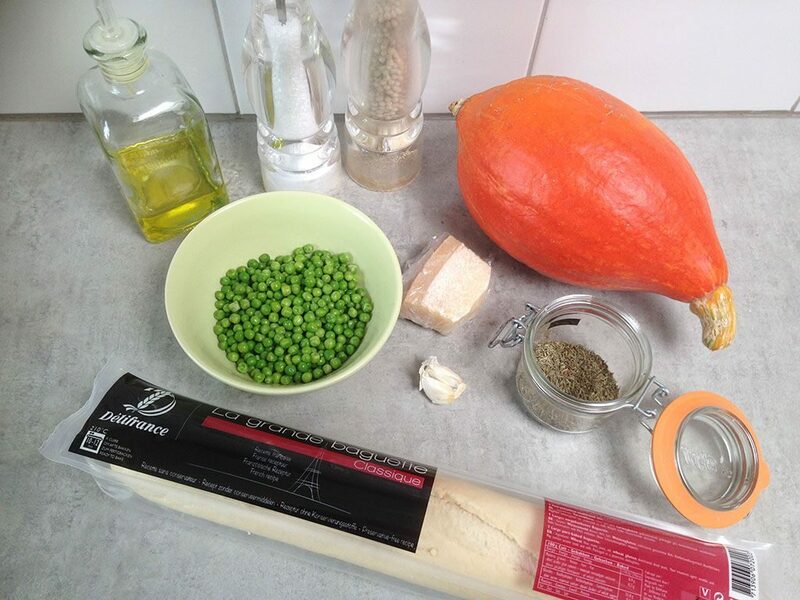 DIVIDE the pumpkin into small pieces and transfer them to a small oven dish. DRIZZLE with pepper, salt, olive oil and dried thyme. CRUSH a garlic clove and add it to the oven dish. BAKE the pumpkin pieces for about 20 minutes, depending on your oven and size of the pumpkin. Meanwhile fill a small pan with water and a pinch of salt and bring to a boil. COOK the peas for a few minutes in the boiling water. DRAIN the peas and set about 50 ml of cooking water aside. 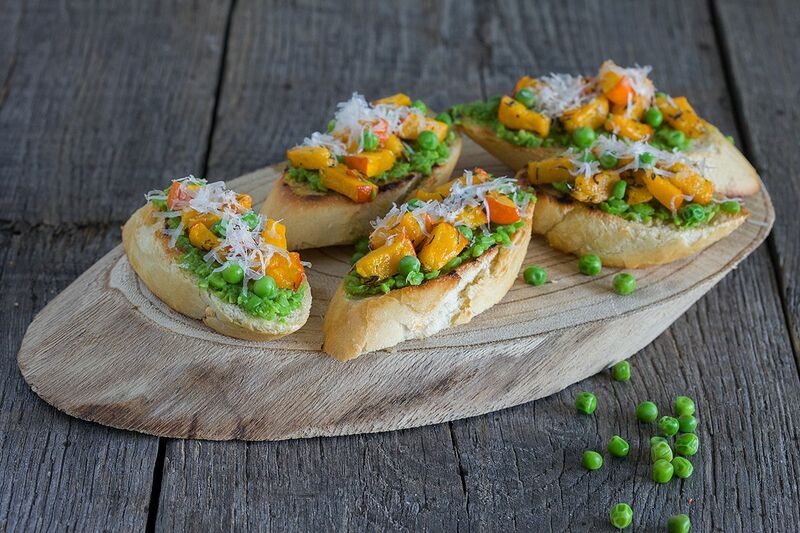 Keep about half of the peas aside and create a coarse puree from the other half. ADD about 50 ml of the water and use an immersion blender. SEASON with pepper and salt and set aside. DIVIDE the baguette into pieces and heat a grill pan. 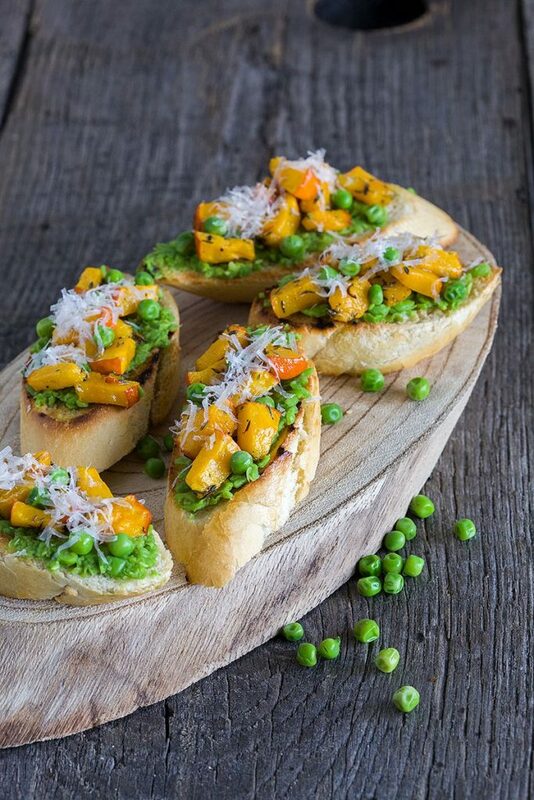 DRIZZLE the pieces of bread with olive oil and GRILL them on both sides for a few minutes. PEEL the second garlic cloves and rub it on both sides of the grilled bread pieces. 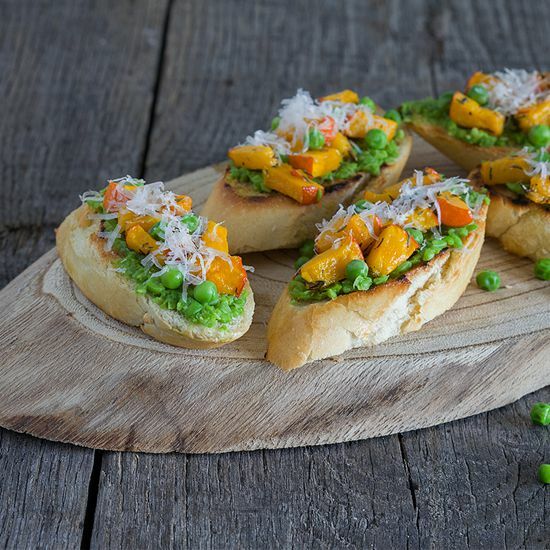 COAT every piece of bread with a thin layer of pea puree and divide the pumpkin pieces (without the whole clove of garlic) and peas on top. FINISH with grated cheese, enjoy!